Over the years, retailers have implemented a J-hook or a strip clip program that hangs off the shelf every 8 or 12'. Strip clips, either 1 or 2 sided, do not look visually appealing due to products hanging in different directions and looking unorganized. When shoppers pull products off of strip clips, they don't return the product to the strip, they put it on the shelves, thereby increasing the in-store labor/maintenance to re-merchandise the products. The strip clips are also more difficult to reload. 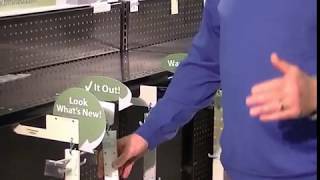 Over the years, we have evolved the impulse and cross-merchandising campaigns by creating strip and panel systems that utilize peg hooks. Most retailers agree that by creating a stronger more visually appealing impulse display program which is shopper friendly and ideal for the store-level teams, this display is a winner and is the reason why it is the most widely accepted display by retailers from every industry across the nation. The peg hooks on the strips/panels are easy to shop, easy to reload and can offer multiple SKU/variety of product per display if desired. Many times boxed/bottle products need to be merchandised off the gondola shelving. We have created a variety of wire shelf extender baskets and clear acrylic bins that mount to the shelf edge and extend out for impulse sales. Off Shelf SwingStrip® brackets make products stand out. Proven to out-sell traditional disposable plastic strips and J-hooks. Available in stock colors of white or ivory, with special order colors available. UnderShelf SwingStrip® brackets make products stand out. Mounting the bracket under the shelf allows products on the shelves to be 'fronted' to the edge. Proven to out-sell traditional disposable plastic strips and J-hooks. Available in stock ivory, with special order colors available. 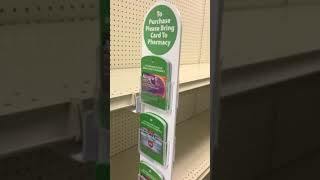 Our shelf extenders allows merchandising space in front of existing products for new products or promotions. Can fit boxed, bottled and carded products throughout the store in hard to merchandise areas.